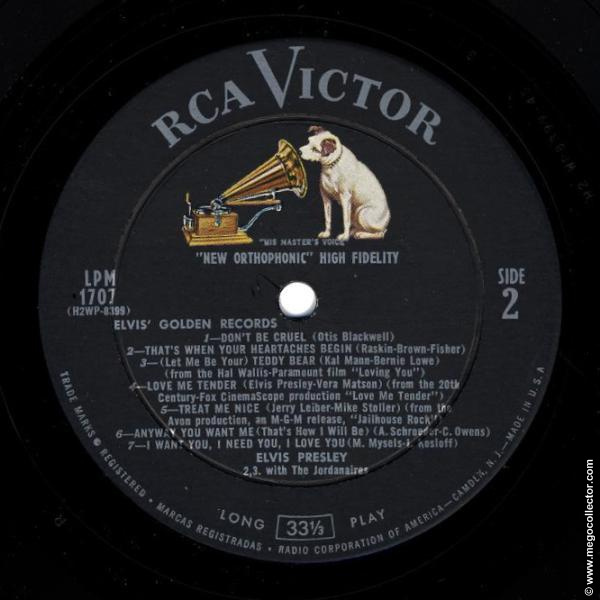 Elvis’ Golden Records (LPM-1707) is the fifth album by Elvis Presley issued on RCA Victor Records, March 1958. 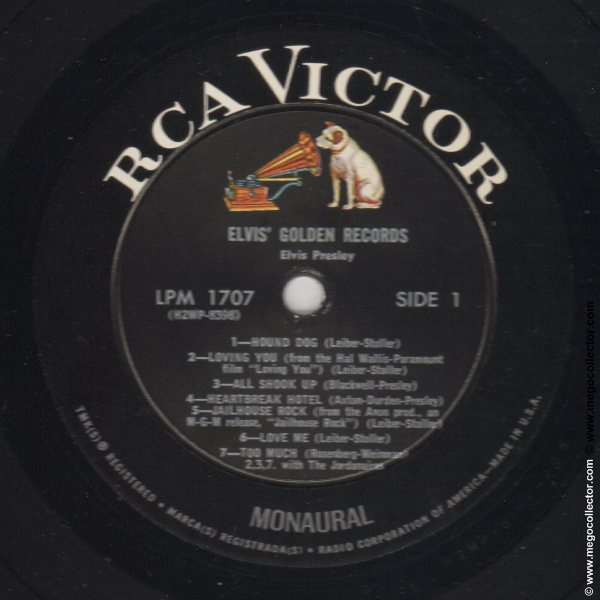 This monaural release lasted through the late 1960s. There are at least three major release dates depicting in label variations. There are at least that many cover variations. 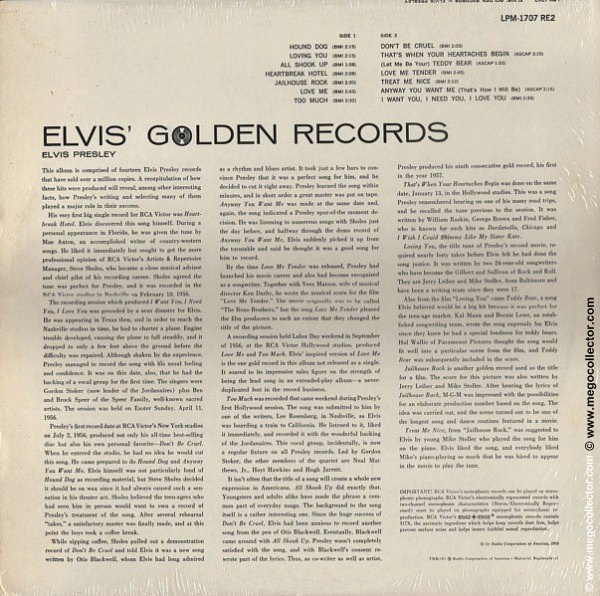 There are many possible cover, inner sleeve, and record combinations. 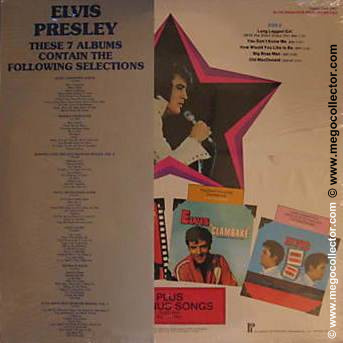 This guide is focused on identifying the variation as it exists, not possible combinations starting with the original Long Play to the Mono through to the Monaural releases. 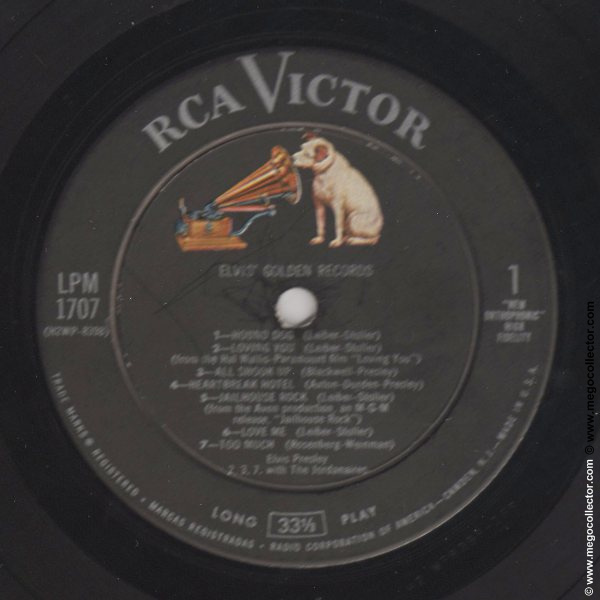 Front: RCA Victor logo with number in box at the upper right. Title in any varying pitch of blue letters. Contents not printed on front. Stock may be either flat or glossy. Back: Contents two rows across the top. Three columns of text. Title and artist centered across the top. The number is in the upper right hand corner. 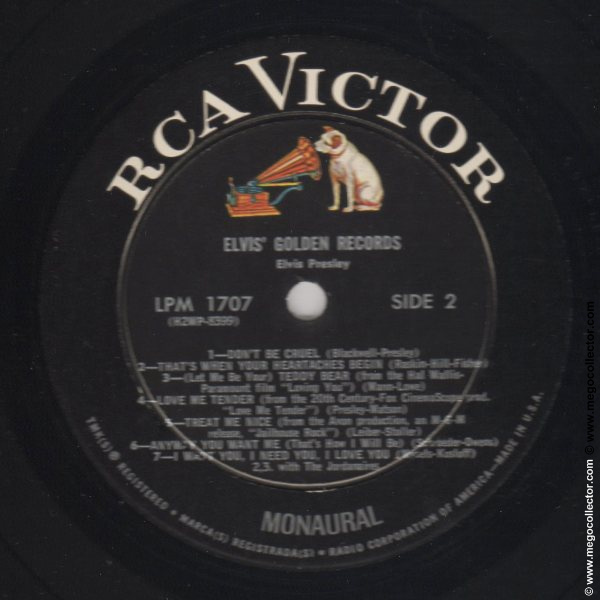 The first release March 21, 1958 has the number LPM-1707 and the later 1958 pressing LPM-1707 RE. RECENT DISCOVERY! The difference between the LPM-1707 and LPM-1707 RE backs. 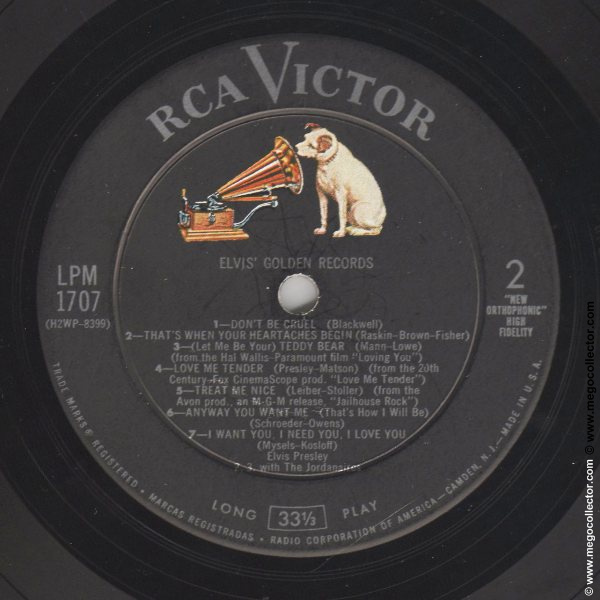 To my logic, there is no particular reason why RCA would simply change the LPM-1707 to LPM-1707 RE without any other changes. Well after re-reading the backs several times, I discovered the difference. On the LPM-1707 back, The beginning of the last sentence of the first (left) column begins “After thirty-one grueling “takes” a satisfactory master was finally made, and at this point the boys took a coffee break.” On the back of the LPM-1707 RE, the same sentence reads, “After several rehearsal “takes”, a satisfactory master was finally made, and at this point the boys took a coffee break.” The difference is “thirty-one grueling” was replaced with “several rehearsal“, which is a bit of a rewrite in history. 1958 -Black Label. “Long Play” at bottom. NEW ORTHOPHONIC FOR FIDELITY centered on top under dog. 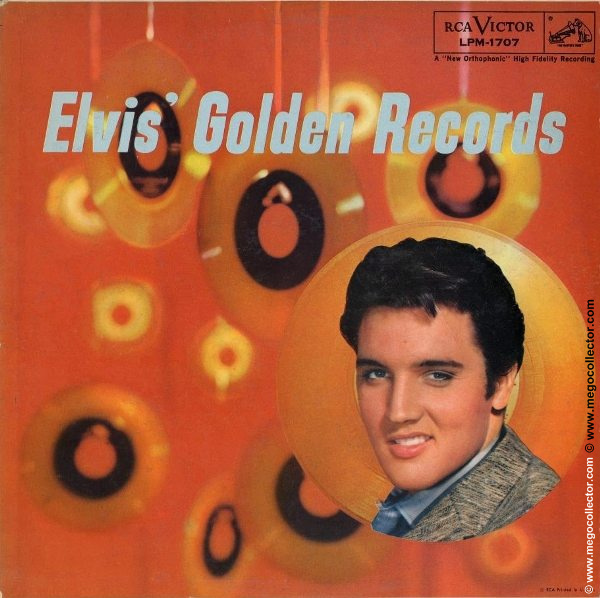 ELVIS’ GOLDEN RECORDS off-centered under the spindle hole. 1958 -Black Label. “Long Play” at bottom. Title centered under dog on top. NEW ORTHOPHONIC FOR FIDELITY on side under side number. Black, white and red. 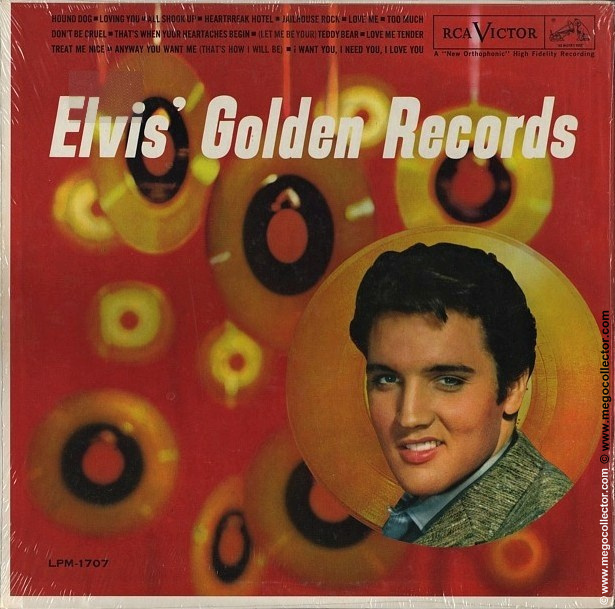 Pictures Loving You, as one of five LPs in the “Popular” category. 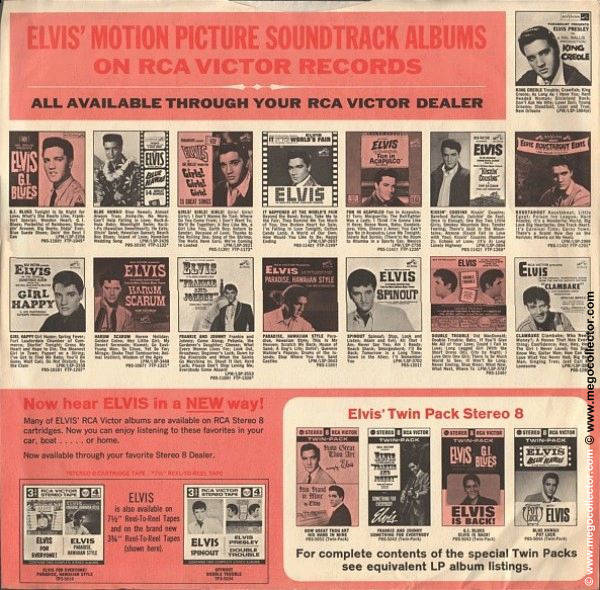 or any number of early Elvis inner sleeves. 1960 – 21-112-1 Pt. 22C – Black, white, and red. 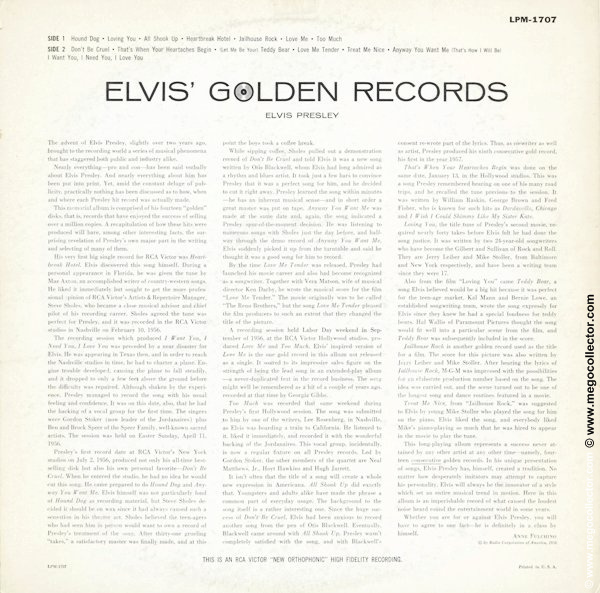 Pictures Elvis’ Gold Records, Volume 2 (Side 1, row 2, column 4). 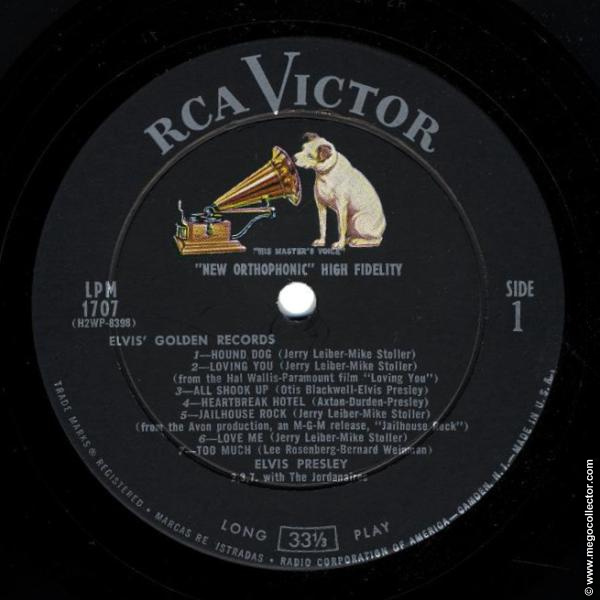 Front: RCA Victor logo in box at the upper right. Number in lower left. Title in white letters. Contents printed across the top. Back: Contents two in two columns aligned to the right. Three columns of text. Title and artist aligned to the left across the top. The number is in the upper right hand corner as LPM-1707 RE2. 1958 -Black Label. “Long Play” at bottom. 11/1963 – Black Label. Mono at bottom. 10/1964 – Black Label. Monaural at bottom. This article is a living document. 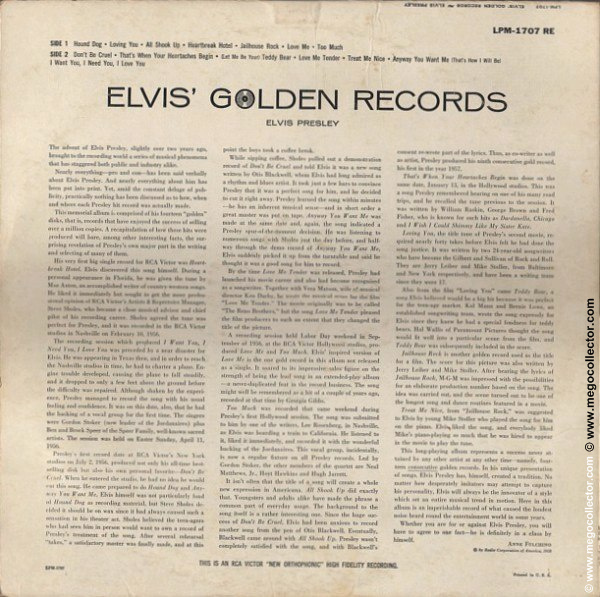 Although this discography covers only those Elvis releases between 1955-1977, there are variations and discoveries made nearly every day. It is the goal of this site to preserve that information. The information provided has been compiled through years of research, books by Paul Lichter and Jerry Osborne, auctions, internet auctions, my personal collection, and various images collected throughout the years. The majority of the images are from my personal collection. It will be a costly endeavor to purchase all variations and document them. In some cases, images are mock ups to fill in the blanks or because I am too lazy to scan in another nearly identical record. As an example, in this case, applying the sticker to the cover. If there is something that you know to exist or can provide a clear image like those used throughout this article, please contact me. The image sizes desired will fit within 600×600 pixels. I will reference you. What is written here is not complete or final.